NASHVILLE, Feb. 20, 2018 /Christian Newswire/ -- Getty Music in association with OMF have announced the third annual Global Hymn Sing, encouraging churches around the world to join together in song across nations, denominations and languages. The campaign, which in previous years has seen over 1.5 million people take part across 100 countries, aims to draw together churches and encourage them to focus on the mission of Jesus Christ through the words of the classic hymn, "Jesus Shall Reign." As part of the campaign, scheduled for Sunday February 25th, churches around the world will be singing this song in their worship services as an act of solidarity and fellowship in support of global missions to the unreached. Already over 700,000 people from 3,300 churches in 68 countries have signed up for the 2018 campaign, and more are registering their participation every day. In 1925, the Scottish athlete Eric Liddell decided to finish his career less than one year after winning the gold medal at the Paris Olympics to become a missionary in China. The media called him a fool, and when he was leaving Edinburgh's Waverley Station, he was asked to comment and instead of making a statement he sang this song, "Jesus shall reign where'er the sun does his successive journeys run, His kingdom stretch from shore to shore till moons shall wax and wane no more." 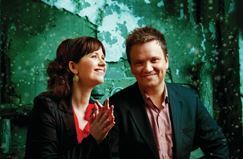 Keith Getty says, "This hymn, Jesus Shall Reign, is very special to me. In that moment when the world was against him, Liddell stood firm and continued on the mission he knew God had called him too. The story of the church in China has been an incredible one, growing from 1 million believers to an estimated 100 million believers today. We want this campaign not only to be about congregational singing, but churches partnering in missions to see more lives impacted by the transformational message of the gospel." The Gettys have written a new chorus for the long-loved hymn, creating a contemporary church setting for this year's Global Hymn Sing. The Gettys are also continuing their partnership with missions agency OMF who serve the church and seek to share the good news of Jesus Christ in all it's fullness with the peoples of East Asia. The organisation supports church planting, missional business, student work and medical practice, and aim to present the gospel in a culturally relevant way. Dr Patrick Fung, OMF General Director says "Nearly one-third of the world's population live in places with little or no access to the gospel. That's over 2 billion individuals worldwide who need someone to share the good news of Jesus with them. We are passionate about drawing together the church around the world and we believe the Global Hymn Sing is a great opportunity to encourage more individuals and churches to engage with global mission." The song, the sheet music, MP3s, and many other resources are now available free at www.globalhymnsing.com.